How Is The Dryer Ruining Your Clothes? Especially when it comes to your white lab coat, you want to wash your clothing as soon as it becomes dirty so as to avoid buildup of trapped skin cells, sweat, and bacteria. But you might want to give a second thought before throwing your clothes in the dryer every time you wash them – the dryer is probably doing a lot more damage to your clothes than you think. Though some companies offer shrink-free clothing, you always want to err on the side of caution and air dry your clothes to avoid shrinkage, if possible. One study revealed that drying shrinks clothing twice as much as washing, and tumble-drying shrinks twice as much as air-drying. Have you ever fallen victim to throwing a new sweater in the wash, only to find the dye has leaked out all over the rest of your clothing? This is actually from washing, but it turns out that drying at high temperatures can cause color leaking also, due to the sublimation of the color dyes once they reach 340 degrees or higher. 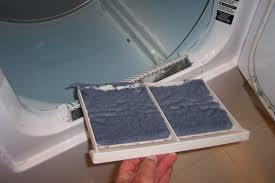 Every time you clean your lint filter, you are holding the physical evidence of your dryer wearing out your clothes faster. The tumble-dry setting and mechanically pumped-in heated air does microscopic damage to your clothes – though it’s invisible to the naked eye, this damage definitely contributes to a lot of the wear and tear in your clothing. If all of this isn’t enough to convince you to air-dry your white coat, at least put your dryer on tumble-dry setting without heat: a study showed that tumble-drying without heat only results in a 24% loss of tensile strength of fabrics, only half as bad as the hot cycles. This entry was posted in Modern Fashion, Trends In Medical Apparel and tagged Wear And Tear on May 16, 2016 by Ariel Jacoby. Pingback: Do You Need To Dry Clean Your Lab Coat?